When I was growing up, the Salem Public Library in Salem, Oregon was one of my favorite places to go. I have strong memories of my time spent in the children's area, hanging out with my best friends Betsy and Star, Encyclopedia Brown, Mrs. Piggle Wiggle, and many more. I also remember the summer reading programs. One year they had an elaborate map on a big platform someone built (this just in from BJ, a librarian at the Salem Library: that person is named Linda, and she has been building the summer reading program gameboards for 35 years!!!! Oh my gosh! She must have built that one I remember so vividly all those years ago!). It was one of the coolest things I'd ever seen. I remember sitting and looking at it one day for a LONG time, excited to travel around the various places as I read the necessary number of books. This week, you'll see a bunch of bloggers participating in what is known as the library-loving blog challenge. Participants are asking you to comment and for each comment, a library will get a monetary gift. A lot of libraries are really struggling right now. This is one way we can support the important work they do in our communities. I think sometimes we forget that we can help libraries directly, by donating books or money. So, yes, I'm participating in the challenge, with my donation going to the Salem Public Library, as a way to say thank you for all those wonderful memories I have. I will specifically ask that the money be used for the youth services department. So, for every commenter on THIS post between now and midnight, March 24th, I will donate fifty cents (up to $60). I wish it could be more, but I'm guessing every little bit helps. So, that's it. You comment, I send the library a gift. If you don't know what to say in your comment, "I love libraries" is just fine. Please note that my pledge is “per commenter”—so if a single person leaves 50 comments, that still only counts once! But you can do more by spreading the word - feel fee to link to this post, tweet about it, and send your friends here so they can comment and raise more money. If you’re moved to make a flat-fee donation to your library, or to start your own challenge, you are quite welcome, and please leave that information in the comments. For a complete list of participating bloggers (and to visit other sites where you can help libraries just by leaving a comment!) visit the writerjenn blog at http://writerjenn.livejournal.com/. As a way of saying thanks for stopping by, I have an Advanced Reader's Copy of SHADE by Jeri Smith-Ready that I will give to one lucky commenter after the challenge ends. I'll draw a name and who knows, it could be yours!! SHADE (Simon Pulse) comes out May 4th and believe me, this is going to be a book you do NOT want to miss. It is the perfect combination of mystery, ghosts and romance. You know how much I love ghosts and romance!! Hooray for helping out libraries! Yay for Mrs. Piggle Wiggle and long afternoons at the library! I spent many many nights and days at the library - and read a lot of judy blume, sweet valley high and baby-sitter's club and Nancy Drew books - all of them in our local library, in fact! Thanks for caring about Salem Public Library and the Youth Services department, all of whom are hard at work on the 2010 Summer Reading Club. Linda, the same creator of the Summer Reading Club gameboard that captured your interest when you were young, will again charm our young book lovers with what I guess is her 35th SRC gameboard. We love our Library users! Ah, Encyclopedia Brown and Mrs. Piggle-Wiggle...two of my favorite childhood books too! Yay for libraries! I remember Encyclopedia Brown! Good luck on your challenge! Commenting - I'd completely forgotten about Judy Blume! GO Lisa! Love your post, and thanks for doing this :). Ooh and I am so totally lusting to read Shade too! Yay for awesome authors! Chasing Brooklyn was one of my favorites. Shade looks great too! Thanks for being you. Libraries Rock! Libraries rock! Thanks for doing this! Salem Public Library is still one of my favorite places to go! And Linda's gameboards are perennially a wonder to behold. Thanks for the highlighting a great library! The kids and I LOVE our library!! We go there every two weeks. The public libraries here (in Dominican Republic) don't have as many children's books as they should... so i had to resort to bookstores that had a nice children's area... and when i started working in a bilingual school i started re-reading my favorites and some children's classics (incluiding Mrs. Piggle Wiggle, which i LOVED)! Awesome way to help out libraries =)! I just can't live without my libraries! Thanks for helping out! Libraries need to continue to be relevant in the future. Thanks. Thanks so much for your generosity. As a children's librarian, this makes my heart happy on a gloomy day. Libraries now! Libraries tomorrow! Libraries forever! As a former librarian, HUGE THANK YOU, Lisa! Great idea and I'm sure they would love any donation! I love going to the library...There is something about checking out a bunch of books that makes me feel like I'm bringing a bunch of treasures home. My favorite book from childhood is Henry Huggins. I was insane for the donut machine. What a great post! I used to love Mrs. Piggle Wiggle! Ooh, I am very fond of mysteries and ghosts and romance. And libraries! This is great! Most libraries are in dire straights right now! I know the Ohio libraries can use all the help they can get! The public library played a major role in my childhood. Favorite book: Harriet the Spy. Here's to the power of bloggers and to libraries around the U.S.
What a great idea. I loved the summer reading club as a child here in Salem and my kids love it, too. I was totally hooked on the Three Investigator books from the library when I younger. I think we went to the library like 3 or 4 times I week when I was a kid. I don't use the library now, but there are a lot of found memories. 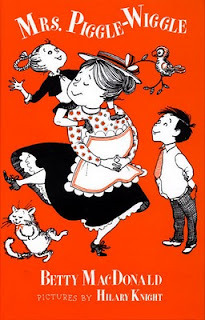 I LOVE the Betsy books :) my sister and I had so much in common with them. her name being Betsey and my birthday being 12/24. super fun memories. Thank you for helping Libraries! I work in a public library and am finishing up my MLIS (the master's degree required to work as a librarian.) I love libraries so much, I made it a career! Thank you for your support of public libraries. What a great idea. I donate books to my local library every year (usually a few boxes of them). There's nothing like researching in the library. Internet kids today don't know what they're missing. And please count me in for the Shade giveaway. I'd love to read it. That's a lot of comments!!! Yay! Yay, Lisa for doing this. You're right... every little bit helps. Hi, Lisa! I LOVED Mrs. Piggle Wiggle - great pick. I'm doing the challenge at my blog, too, Holly Cupala, Tell Me a Secret! Library Love!!!!! I've posted my challenge too! As a teen-services librarian, I think it is awesome that people support us so much. Thank you. I feel at home in libraries although I have to admit I haven't been in a while. Perhaps it's time for another visit! :) This is a lovely thing that you're doing, well done you! I visit my local library every week, know the librarians by name, and consider it a second home. Bring my children, too, in hopes that they will also find it a place of book joy. Thank you for lending your support to libraries. BTW--loved CHASING BROOKLYN! I've been volunteering at my local library since I was in the 6th grade (I'm in 11th now), and have been a frequent visiter at the library since literally infancy, making it so that all the librarians know me by name. Anyways, it just delights me whenever someone wants to help the library, and if I can do my part simply by commenting, then that's what I'm going to do. Thanks for doing that! I ♥ libraries! I'm amazed by the people who don't use libraries and who arrogantly assume that no one else does, either. Seems like every news story about libraries generates these cranky responses. Here in Los Angeles, our public libraries are busier than ever, and getting less funding than they have in years. They're having to lay off staff and cut hours. I know these are lean times, but I worry that a tide of ignorance is doing permanent damage to an important public good! I'm glad that this awareness campaign is underway. Libraries are awesome. I love them! Thank you for all you do to support libraries, Lisa!! This is such a great idea! YOU rock :-D.
Love Mrs. Piggle Wiggle! Thanks so much, Lisa, for reminding us all why we love our libraries! Libraries are so important! I volunteered at the public library during my high school summers. What an awesome idea! Good for you! And great for libraries! I love childhood memories of libraries. Awesome indeed. Hey, it's good to see people showing some library love! When I was very young, our town was so far from civilization, we didn't have a library! Although I live in Connecticut, I have spent some time out in Salem, OR while my husband was staffed on a project there, and we loved it. Salem is a wonderful town, and I'm thrilled you're supporting the library in such a meaningful way. Like you, I have such fond memories of visiting the library as a child. I loved the musty smell, and I was amazed that I could get all of those books for free! I even remember the names of the librarians. There is nothing like a great book, or a great library. Cheers from a fellow library lover! Thanks for supporting libraries! Every little bit DOES help! Lisa, I've just found your books and blog. THANK YOU -- oh and I love libraries!! Lots of library love, and lots of love to you, Lisa!!! Oh, my gosh! I have been looking for the Mrs. Pigglewiggle Books for my 6-year-old son! What a coincidence that you have a picture of one on your blog; I remember borrowing a copy from my elementary school's library. I also have fond memories of the summer library programs in my village library. Sometimes my mom would help out by bringing her guitar and singing a few tunes us. Happy times. I absolutely love the Salem Library. It is the one I've grown up using. I also always did the summer reading programs. Keeping track of all the time I spent reading so I could get tickets to win prizes. So much fun. I loved the Mrs. Piggle-Wiggle books too, and so many other books. I spent lots of time at my local library as a kid. Thank you so much for supporting libraries! Today, I dropped off a few finished books I got for review at the library. I hope there are libraries in heaven! I love libraries! But the only one that's filled nearby is the only on a military base--that library also has a PS3. D: Lucky them. The other library near my house has hardly anything.